Microsoft has changed the name of VSTS to Azure DevOps. Learn about the newest features and how to start using Azure DevOps. Yesterday, Microsoft announced a change in naming for VSTS, now branded as Azure DevOps. You can read most of the details in this blog post and if you are using VSTS right now you will not have a big impact in the future. Even if this is just a rebranding of the service, there are a couple of suggestion I'd like to give you to have a smoother transition. 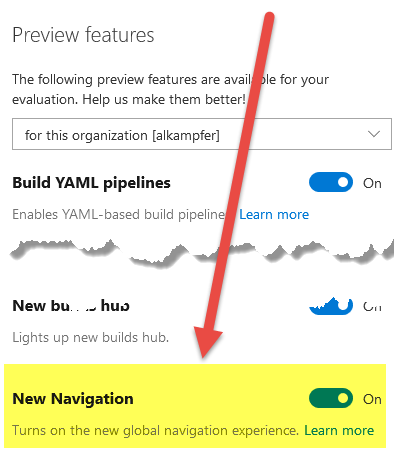 First of all, if you still don't use the new navigation, I strongly suggest enabling it, because it will become the default navigation in the future, and it is best to gain familiarity with it before it becomes the only UI available. Enabling the new navigation for the account. The nice aspect is that you can enable new navigation only for your account, then enable it for all accounts in the instance. This will make the transition smoother, as you can find key members of your teams who want to try new features, let them explore it, and after some time, let everyone use the new interface, knowing that at least some core members of the team are used to it. Planning for a smooth transition instead of having big bang day when everyone can only use the new UI is a wise approach. Another suggestion is starting to use the new links right now. If your account is https://nablasoft.visualstudio.com, your new URI will be https://dev.azure.com/nablasoft and it is already available for all of your accounts. You can expect that the old URI will work for a really long time, but it is better starting to use the new URI as soon as possible, to avoid having the link in the old format that may cease to work some time from now. Changing the URL of origin to adapt to the new URI of Azure DevOps Repositories. Another part of the service that is affected by the change of URI is the remote address of Git repositories. Microsoft assures that the old URL will remain valid for a long time, but it is good to spend a minute updating remotes so you will never worry that someday in the future, the remotes' URI could break. Updating gGit remote address is a good practice to immediately start using the new and official link. Thanks to Git, the only thing you need to do is grab the new link using the new UI, and use the command git remote set-url origin newlink to update the URI of the remote to the new one, and you can continue work as ever (the first time, you will be prompted by a login because you've never authenticated Git to the dev.azure.com domain).